One of the patriarchs of my church challenged the women to not go on vacation from studying God’s Word this summer. She said just because our calendar & schedule changes, does not mean we should just put God on a shelf. He doesn’t take the summer off and neither should we! As children reprimanded by Momma, some of us have dove right in to a study on David. “Anointed, Transformed, Redeemed” by Priscilla Shirer, Beth Moore, and Kay Arthur is one that will cause the student to go deeper in study and relationship with God. Today, I realized I better get started on my homework or it won’t be done by Lesson #2 on Monday. Week one, day one assignment focused on the fact that we are hand picked by God. I’ve known it, heard it, read it before, but the assignment taking a closer look impacted me differently than ever before. In John 15:16 Jesus says, “You did not choose me, but I chose you”. So many times I have thought more in terms of I chose God; I chose to follow Him. Which is true I did, but he chose me first. That may be a bit confusing so let me give an illustration. Think of recess at school, the organized game of the day is kickball. Before the game can begin, we must choose teams. So the captains begin choosing who they want on their team. When I am chosen by Captain #1 to be on his team, I have an option to say “yes’ to his team, or say “no way” and head to the merry-go-round instead. The same is with God. He chooses us to be on his team. The realization that He handpicks us has a much greater impact than the simple idea that my response is to follow him. According to Acts 13:22 we are told that David was a man after God’s own heart. Just as God chose David many, many years ago, He is still choosing men, women and children who desire to honor and serve Him. God has handpicked you! How will you respond to Him? I keep seeing posts titled Transformation Tuesday. I’ve seen baby-to- teen pictures, before and after dramatic hair changes, stories of the transformation of a large weight loss, DIY projects, and the list goes on. Well, today while I was doing some of my own do-it-yourself makeovers I decided I may as well share my own transformations. This first one only took about 10 minutes, and most of that time was finding my supplies. Instead of throwing away a couple pillows which had gone flat, I stored them in the closet with a some repurpose ideas in mind. Today was the day to pull them out and stuff them in an old muslin dyed and stamped dog food sack. 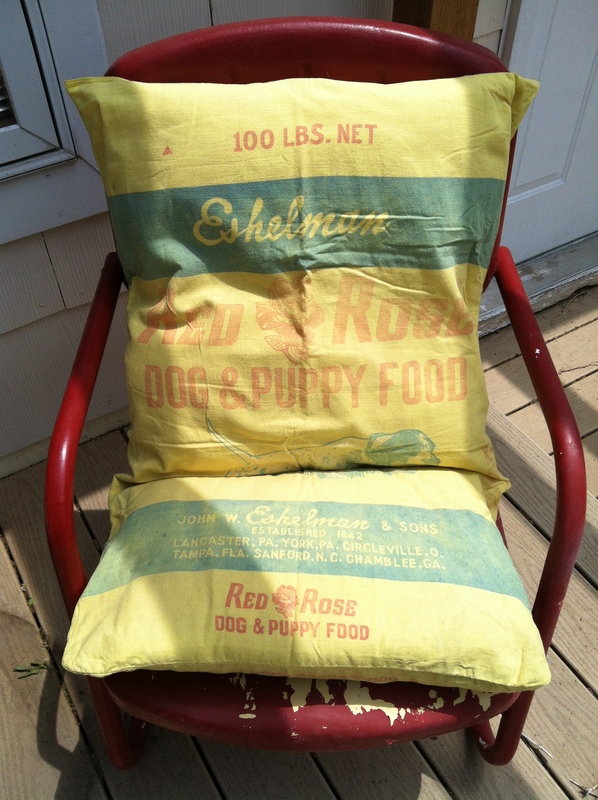 This combo teamed well to make a cushion for my red metal chair on the patio. My next project was the corner cupboard that used to be home to bath towels in my pepto-bismol pink bathroom. Since the bathroom has been gutted and getting its own transformation, I will no longer be using the cupboard there. 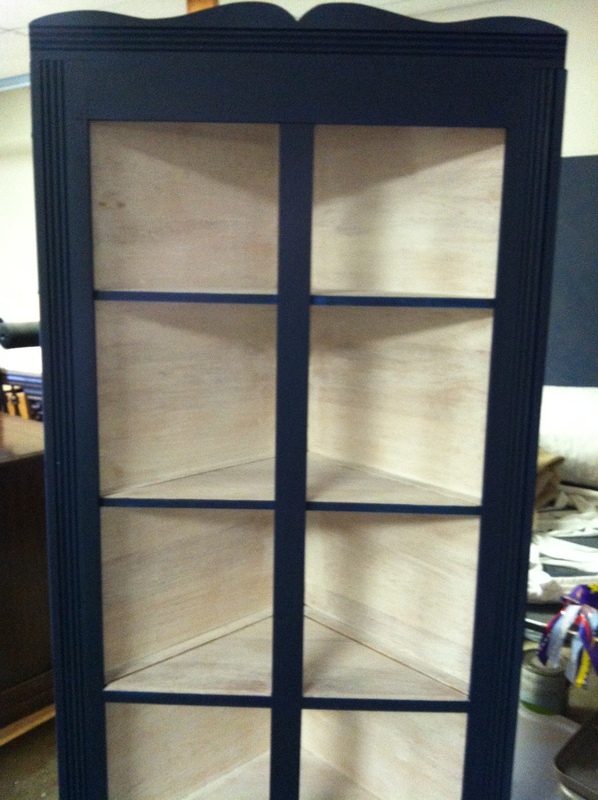 Instead, I’ve removed the glass doors, and painted it navy blue with white wash insides. This will be relocated to my sewing/guest room to display family heirloom quilts. How many times do we try to change all by ourselves in our own power? I have so many times and failed miserably. Also as women, we let negative thinking dominate too much and often compare ourselves to others. This verse specifically tells us to let God transform us by changing the way we think. When we let him do this we are promised that we WILL learn to know God’s will which is good, pleasing and perfect. Now that’s what I call a transformation! Take this Transformation Tuesday challenge and expect great things. Have a Wonderful Wednesday.